Here comes the sun! I love when spring arrives. Something about having made it through winter makes me happy and you know how bitter winters are in Texas. Spring means more hours of sunshine, the return of locally grown fresh fruits and vegetables, and sitting on the patio watching the kids play in the backyard. Bruschetta is easy to make but feels more sophisticated than a basic dip. Perhaps it’s because people recognize the time you spent chopping the tomatoes. Invite some friends over to enjoy the nice weather, take your allergy medicine and whip up a batch of bruschetta. Happy Spring! Wash, remove seeds and chop tomatoes into small pieces. Chop basil into small pieces as well. Mix together and add remaining ingredients (#3-7). Slice baguette into thin rounds (about ½ inch thick). Place on a cookie sheet in the oven under the broiler. Watch carefully so as not to burn. Depending on how close the upper rack is, this could be as quick as 30 seconds. Flip and broil on the other side. The goal of crisping is so that the bruschetta does not make the bread soggy, however not so crisp that someone chips a front tooth biting into the bread. We all know the saying, “when life gives you lemons…” There are some days, or in my particular case, some people, when lemonade just isn’t enough. Right now I am dealing with a real sourpuss. Nothing is easy with her. Her knee jerk answer to any question is “no.” Seriously? Give me a good, rational explanation and I will leave it alone. I have been working through one modest request and have been shot down twice. Instead of taking another rejection over email, I decided to pick up the phone. Lo and behold, it worked! My charming personality must have won her over or perhaps it is harder to refuse when faced with the request “directly” vs. the “anonymity” of email. As my mom taught me, "kill 'em with kindness." If that doesn’t work then I can always resort to bribery. I am not above it. So the next time life gives you lemons, make a lemon cake (or pour yourself a tall glass of wine and let your husband deal with the kids for a night)! 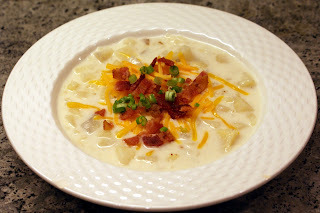 This recipe comes from Barefoot Contessa’s Parties! cookbook. It and the other lemon pound cake recipes that I reviewed were more involved than I imagined or maybe I just started baking too late at night. This recipe yields 2 cakes so at least after all of your work there’s a cake for you and one for a friend. The cake has a nice, mild lemon flavor like a tea cake but not super lemon-y like the lemon squares mentioned above, the cupcakes at Sprinkles or the lemon cake at Starbucks. If you have a tangy lemon cake recipe, please email it to me. I would love to try it! Preheat the oven to 350. Grease, flour and line the bottom of two 81/2 x 4 ½ x 2 ½-inch loaf pans with parchment paper. Cream the butter and sugar in the bowl of an electric mixer with the paddle attachment for about 5 minutes or until light and fluffy. With the mixer on medium speed, add eggs one at a time and the lemon zest. Sift together the flour, baking powder, baking soda and salt in a bowl. In another bowl, combine lemon juice, buttermilk and vanilla. To the batter, alternate adding the flour and buttermilk mixtures – start by adding part of the flour, then part of the buttermilk, then flour, etc. until complete. The last addition should be the remainder of the flour mixture. Divide the batter evenly between the two pans, smooth the tops and bake for 45 minutes to 1 hour (mine took 55-60 minutes) before a cake tester came out clean. Combine these 2 ingredients in a small saucepan and cook over low heat until the sugar dissolves. When the cakes are done, let them cool for 10 minutes, flip them onto a rack set over a tray and spoon the lemon syrup over the cakes (the syrup tastes like a lemon drop). Allow the cakes to cool completely. Combine the confectioners’ sugar and lemon juice in a bowl mixing with wire whisk until smooth. Pour over the top of the cakes and allow the glaze to drizzle down the sides. My glaze seemed thinner than the picture so I reglazed twice more with what slid off into the pan. During the planning phases of the shower, Carrie asked us to serve her mom’s potato casserole. Aunt Chris willingly shared this recipe and notes that it comes from another Junior League cookbook – this time the Junior League of Corpus Christi, Fiesta – Favorite Recipes of South Texas (1975). It was a perfect complement to the chicken fingers and easy, easy, easy (this is why I need "gym therapy"). I mixed it the day before, stored it in the refrigerator and just baked it at the hostesses’ home. You could probably add your favorite baked potato toppings at the end – like bacon or green onions – if you choose. Combine all ingredients (#1-5) except cheese and put in 9x13 baking dish. Bake at 350 for one hour. Remove from oven and top with cheese. Return to oven and bake until melted. Judy, the other loving grandmother to my cousin's precious baby, provided the recipe for this potato casserole which was served at a recent family gathering. Ironically it is quite similar to Chris' - these grandmas sure know how to cook. Combine the hash browns, sour cream, soup, cheese, butter, salt and pepper; spoon into a lightly greased 13x9x2 inch baking dish. Sprinkle with cracker crumbs evenly on top. Bake at 350 for about 40-45 minutes. Makes 10-12 servings. Bubba’s makes gigantic, delicious rolls which taste great slathered in butter and honey. Not exactly “shower” material. Instead, we went with a staple from the Dozier recipe files. My mom says that Mrs. D probably makes 6-8 dozen for her family’s Christmas dinner. 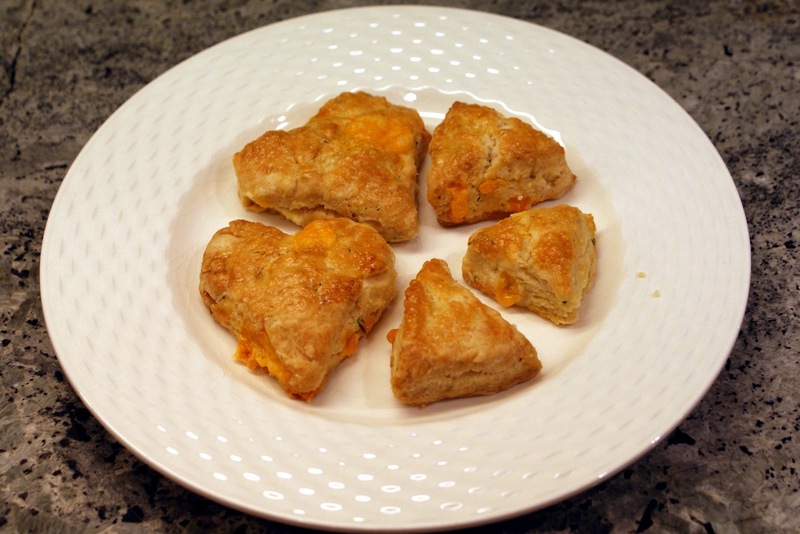 The recipe below makes 2 dozen biscuits. I find it appropriate that Mrs. D was “present” at my cousin’s baby shower since she hosted my wedding shower 15 years ago. I don’t remember if these biscuits were on that menu though but they would be a perfect addition to any meal. Mix the butter and sour cream together first. Then add the Bisquick. Form into balls about the size of a ping pong ball. If you have not played ping pong recently, it is in between a marble and a golf ball. Keep the Bisquick handy as the dough is sticky and you will probably want to coat your hands periodically. Drop into the cups of a greased mini-muffin pan. Bake for 12-16 minutes. Mix sour cream with flour and stir in butter. Fill muffin pans almost to top as muffins do not rise much. Bake at 375 degrees until lightly browned. Yields 1 dozen muffins for full size muffins. Or use mini-muffin pan and decrease the cooking time. If you read Tuesday’s post, you know that we went skiing for Spring Break. We traveled with some great friends from college (side note: they introduced David and me) and their two darling girls. Elizabeth was in heaven getting to hang with the big girls. While we were there, I made Rice Krispies treats. I love the pure, simple goodness of this dessert. They are easy to make whether at home or on the road with just 3 ingredients: Rice Krispies, marshmallows and butter, and minimal construction and assembly. Samantha, the mom, commented on how she had not made these treats in a long time so I am wondering if others haven’t either and this can serve as a reminder. Yes, they are available in convenient, individual packages but homemade tastes so much better which our 5 little taste testers confirmed. Elizabeth was so excited to have spend-the-nights with the big girls every night. On the final night, Andrew had to join the fun and stated “I want to sleep with Maddie.” Luckily Maddie has a good sense of humor and thought it was cute. You have to love the innocence of a 6 year old. In a few years, the adults will not think that comment is as cute. In a large pot, melt butter on low heat. Add marshmallows and melt, stirring frequently. Remove from heat. Pour in Rice Krispies cereal. Stir to mix well. Transfer to a greased (i.e., sprayed with Pam) 13x9 inch pan. Spread evenly. Cover with wax paper, press down lightly on the top to compress and then remove the wax paper and allow the treats to cool before cutting. I admit it. I watch GCB. I also rubberneck when there is a car wreck. Can you believe the caricature portrayal of Dallas women? Trust me, Christians from Dallas have not cornered the market on wearing Christian Louboutin, driving a Mercedes or being gossipy and backstabbing. There is a lot of reciting Scripture. I wonder if they will ever incorporate The Golden Rule: Do unto others as you would have them do unto you. It is humorous to move outside of your hometown or state and to hear people’s perception or reaction to what seems so “normal” where you are from. Before moving to NYC, I interviewed over the phone for an intracompany transfer. The feedback to the manager was “she will never make it in NYC. She talks too slow.” She hired me anyways. My manager, Jyl, said that I was the only person who could turn her name into 2 syllables: “Jee-yuhl.” When I arrived on the east coast, I was advised to tone down my wardrobe (out were the bright colors in place of black, grey and brown). As Frank Sinatra would sing “if I can make it there, I’ll make it anywhere.” Somehow I managed to survive (and enjoy!) NYC, but could I survive the GCB girls? As much as you don’t want to look, this car wreck is appallingly funny and grotesque. In preparation for tonight’s episode of GCB, be a good Texan, make some lemon mint tea, and grab your BFF to text with. Bring 1 gallon of water to boil. Remove from heat. Add ingredients 1-4. Stir to mix well – the goal is to dissolve the sugar completely. Let it come to room temperature. Strain into a container like an old gallon milk jug (rinsed first, please). Chill and enjoy. The Baker's Mann will resume on Sunday, March 18. Enjoy your break, be safe and relax! More baby shower planning. Crepes came to mind as an option because my friend Lesley’s son commented about a crepe place as a favorite destination. What a sophisticated taste for an 8 year old! 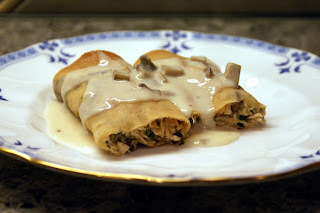 I made my family try a Chicken-Spinach-Mushroom crepe for dinner (trust me, wrap it in a tortilla or crepe and those little eyes cannot easily see the veggies hidden inside). I used a pre-made crepe from the grocery store. Too sweet for my husband’s taste but the kids liked it. That’s ok, he is not invited to the baby shower anyways. Then again, my cousin has stated an interest in fried chicken. If so, Bubba’s – here we come! This recipe comes from the Junior League of Houston cookbook, Stop and Smell the Rosemary. Say what you want, but Leaguers are super proficient in their ability to raise money, provide significant volunteer hours, and write a cookbook. With the leftover crepes, I filled them with softened Blue Bell vanilla ice cream, refroze them and then topped it with cut strawberries and chocolate. Now that is what I call a leftover! For the filling: melt 6 T butter in a large skillet. Add celery, onion and mushrooms. Saute until tender. Add spinach and cook 3-5 minutes. Vigorously whisk in flour, milk and stock. Remove from heat. Add chicken and mix gently. Let cool. Fill each crepe with 1/3 c filling. Roll and place seam-side down in a 9x13 inch baking dish. Cover and bake 25-30 minutes. Top with mushroom sauce and serve. For the mushroom sauce: Saute mushrooms in butter until soft. Add flour, stock and cream, stirring constantly, until thickened. Season with salt. Serve over crepes once removed from the oven. Serves 6. It’s always the mom’s fault. You know that, right? You’re a hypochondriac if you take your kid to the doctor and it’s really not an ear infection. You’re a bad mom if you don’t take him/her out of fear of looking like a freak and it turns out to be a double ear infection and you should have known that because the kid has no fever, is sleeping through the night, and is still eating and drinking. In the past week, I have been told twice that I am feeding my kids poorly. Michael Pollan alerted me to the 26 grams of sugar in Yoplait. I already knew about the Twinkies. A doctor/parent and the nutritionist at my kids’ school talked about fats, sugars, excitotoxins and some other things that I cannot spell. I think I am the only living being on the planet who has not switched to organic milk. I am not ready yet to replace my butter with ghee. I appreciate the doctor/parent’s advice about “you don’t have to change everything, just start with something.” Starting Thursday, I will be drinking organic milk in my latte. By Friday, I expect my skin to glow, my hair to be thicker and shinier, and the extra pounds to have melted away. 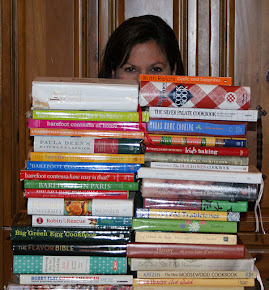 I have started thinking about Passover and Easter recipes to post – they fall on the same weekend this year and with Spring Break coming up, the holidays will be here before you know it. 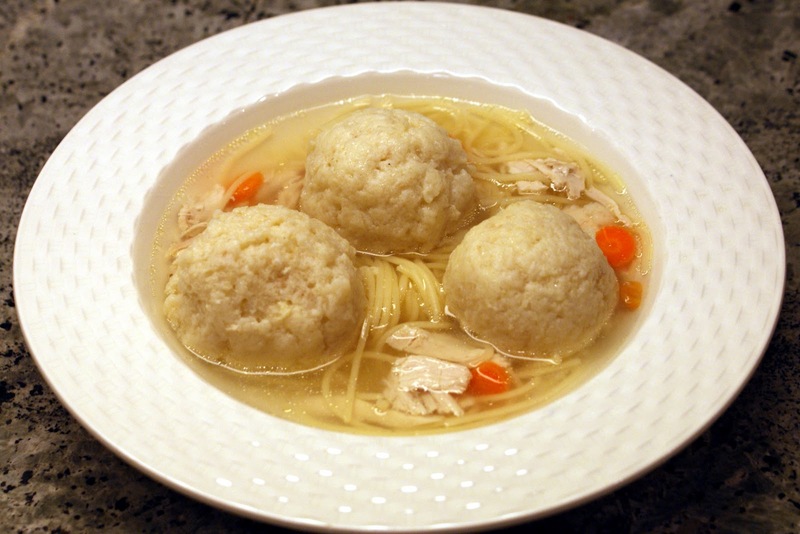 In the past, I would have made matzo ball soup in a chicken broth from a can but my newly attuned sensors screamed MSG, can metal, -oses, -ates, and -ides. I have no idea if canned chicken broth contains any of those but the fear of judgment! I decided to make my own chicken broth. To it I added some matzo balls (made from a box mix by Manischevitz), cut angel hair pasta (because that’s how some of the NYC delis serve theirs) and with the shredded chicken from the broth that I made. Place the chicken and water in a large pot. Bring to a boil, reduce the heat and simmer gently. Skim the impurities off the top of the broth. In a food processor, put the onion, carrot and celery and pulse until finely chopped. Add to the pot. Simmer uncovered for about 40 minutes – the chicken should be cooked by then but you can check it with your meat thermometer. Remove the chicken and save it for adding back to the soup or for another cooking purpose. Strain the broth (only) into a different bowl. Let it cool, uncovered and then refrigerate. When you are ready to serve, reheat. You can add cut or shredded chicken, matzo balls, noodles or cut spaghetti, carrot slivers, parsley, etc. Salt to taste. Who’s the negligent mom now? Is there someone in your life who is brutally honest with you? My editor (and husband), David, is that person. I wrote a post, emailed it to him (he is sitting in the other room but I wouldn’t want to have to get up) for review, and he calls out “I don’t like your post.” Ouch! Should I take that with the “love” that was intended or was it just a rough day on the golf course? I tried this recipe recently because I missed a sandwich that we used to eat when we lived in New York. My NYC friend, Chris T., claims that this bakery is no longer open (on Columbus, west side, upper 60’s – and no, not Columbus Bakery) then again, it has been 12 years. They made a grilled chicken sandwich on a cheddar scone and if you were not there by noon, they ran out. My version of the sandwich wasn’t nearly as good as I remember but the scones themselves are! Now I am trying it out again as a potential item for my cousin Carrie’s upcoming baby shower. I thought making these scones in a bite size morsel could be a good option for our shower menu. I tried a heart shape but think I will revert to the tried-and-true triangle. Combine 2 cups of flour, baking powder and salt in the bowl of an electric mixer with a paddle attachment. I have no idea where the paddle is so I used the flat beater instead. Add the butter and mix at low speed until the butter is in pea-sized pieces. Mix the eggs and heavy cream and quickly add them to the flour and butter mixture. Combine until just blended. Add the cheddar, dill and 1 T of flour. Mix until they are almost incorporated. Put the dough onto a well floured surface and knead for 1 minute. Roll the dough 3/4 inch thick. Keep extra flour handy because this dough is sticky! Cut into 4 inch squares or whatever size/shape you choose. Line the baking sheet with parchment paper and place scones on top. Brush the top with egg wash. Bake for 20-25 minutes until the inside is fully baked and crispy on the outside. Thank goodness it’s Friday! Thank goodness it’s Fry-day! In his book, Food Rules, Michael Pollan wrote rule #39: “Eat all the junk food you want as long as you cook it yourself.” So grab your new bottle of olive oil and box of Kosher salt and get cookin’ – it’s Fry-day after all! 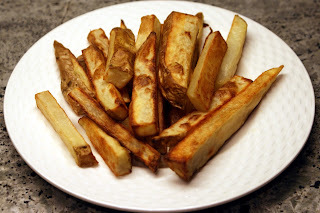 Slice the potatoes lengthwise into 12 wedges each (if too long, cut the length in half). Toss the potatoes in a medium bowl with olive oil. Spray your baking sheet with a non-stick spray like Pam. Spread potatoes onto the baking sheet in a single layer. Roast for 20-25 minutes turning at least once (I flip them more often because I like the brown crisp on all sides) or until lightly browned and crispy on the outside. Sprinkle with salt (and garlic powder if you choose).